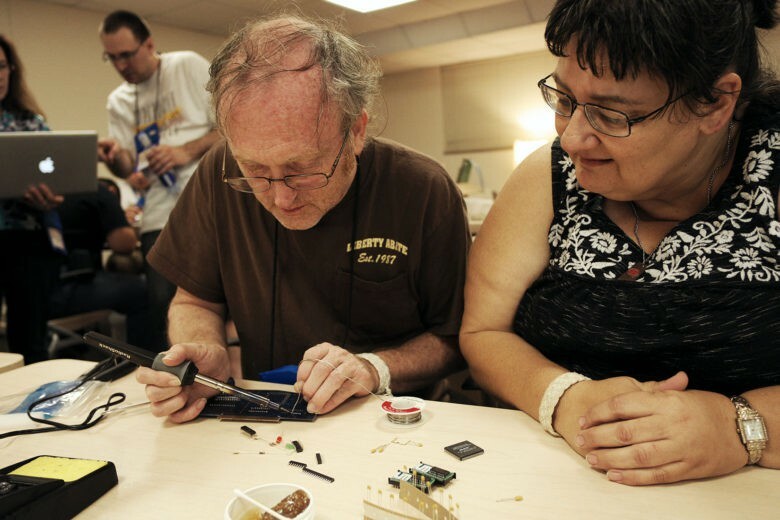 Rachele Lane watches her husband, John, try his hand at soldering at KansasFest. Cult of Mac’s David Pierini is at KansasFest this week to write about the community of people who celebrate the foundational Apple II computer. KANSAS CITY, Mo – If you’re going to carry a torch for the Apple II computer, you better know how to control its heat and melt a little solder. The Apple II will turn 40 next year. Many of these seminal machines will light up like new thanks to a community of people who have to be their own Genius Bar. So KansasFest is not just about love, but the labor of keeping that love alive. 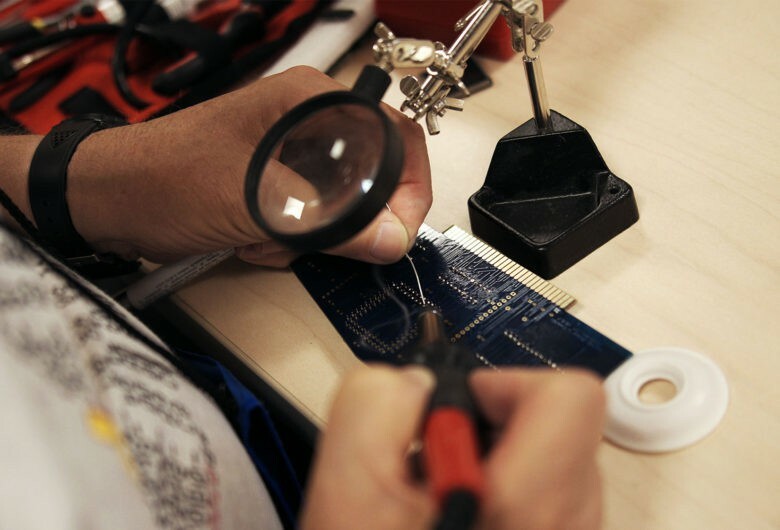 KansasFest, now in its 28th year, always sets one night aside for an activity called SolderFest, where devotees learn how to solder RAM cards and power supply boards. To know how to solder means you can give your machine 21st-century computing powers, as many in the Apple II community have done. Henry Courbis, center, talks with Brian Wiser about installing a power supply upgrade kit. Martino and his colleague, Henry Courbis, of Spring Hill, Fla., tended to their students, hunkered in a dormitory basement at Rockhurst University. Some were soldering for the first time, while others used the session to work on recently acquired machines. Quinn Dunki, a Los Angeles-based programmer, drew a small crowd because of the machine she was working on — a Bulgarian model of the Apple II, which still had much of its Cold War-era dust inside. She worked her soldering gun with ease, using its heated tip to draw in the wire of solder to create tiny, perfect drops. Quinn Dunki and her Bulgarian Apple II drew a crowd during the KansasFest soldering session. Across the room, John Lane, of Sullivan, Ill., slowly melted beads of solder onto a RAM card. He expressed little confidence in his ability to soldering, but his wife, Rachele, sat at his side and assured him his work looked good. She chose not to solder, opting instead to make pictures while her husband worked. Despite the name SolderFest, there were no prizes. Knowing a little more about the care for the Apple II machines is the payoff. Smoke and magnifying glasses during the SolderFest. SolderFest was running late and got interrupted by Happy Hour, which also included Krispy Kreme Donuts.